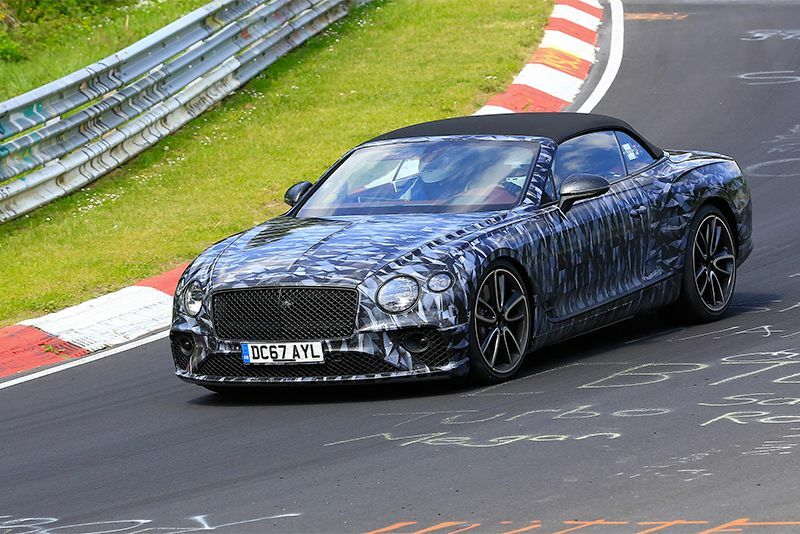 The latest Bentley Continental GTC is on its way and will join the GT coupe in the all-new Continental range. Expect the same opulent four-seat convertible body as the previous generation GTC but it'll likely receive the advancements the impressive new GT has, which is very exciting indeed. This means a new chassis, the one co-developed with Porsche that also underpins the Panamera, which is both lower and wider than that of the outgoing model and should be inherently more dynamic. If the ‘12’ motif on the prototype’s front wing confirms anything, it's that the current 626bhp twin-turbocharged 6-litre W12 engine is hiding under that rather large bonnet. In all probability, it won't be the only option, so expect a V8 and hybridised options later down the line. The new bodywork leans heavily on the Continental GT, although the coupe’s long, fastback-style roofline is the most obvious difference. The fabric roof sports a sharper angle at the real in order to fit under the car’s beltline when the occupants feel like having the sun on their faces. If you like the GT's opulent design, then the new GTC should be right up your alley. The new Continental GT Convertible’s elegant interior is taken directly from the coupe and, as such, will blend the latest (rotating) infotainment system with opulent leather and wood. Due later this year, the GTC is going into battle with the likes of Aston Martin’s DB11 Volante and Mercedes-AMG’s recently upgraded S63 Cabriolet. Bentley's coupe really impressed so our expectations are that the convertible will impress too. We'll have to wait and see who holds the crown after this sumptuous convertible enters the fray.